By: George F. Hommell Jr.
Back in the 40’s and 50’s, there was a small lodge in Islamorada, which catered specifically to anglers call the Barothy Lodge. The owner, Vic Barothy, also had several others including the Turneffe Island Lodge in Belize, and a second Barothy Lodge on an island south of Cuba, known then as the Isle of Pines. This island was later renamed the Isle of Youth by Cuba, as part of their territory. Vic hired me to take his 38’ cabin cruiser, the ‘Islamorada,’ to his Cuban lodge. He intended to use it as a houseboat for his guests who would then fish from smaller skiffs for bonefish, tarpon and permit. The deal was made and in 1954, I got two friends of mine, Chuck Robel and Hazen Jones to join me. During the same period, another man, named Leo Johnson, asked Capt. Jake Muller to take his houseboat, the ‘Tomely’, for the same purpose. We all left Islamorada together, overnighted in Key West on the way, and headed out for Cuba the next morning. In addition to the two houseboats, we were also towing skiffs full of supplies for the lodge including tires, batteries and other items. Arriving at the International Yacht Club in Havana Harbor, just across from Morro Castle, we docked to clear customs. (This was all pre-Castro of course). As expected, the customs officials boarded us and inspected everything in all of the boats. Afterwards, there was quite a bit of talk going on between themselves until they announced that we owed them $500 in duties and that we wouldn’t be permitted to carry on until we had paid it. This was an incredible sum, especially for 1954. I was awed. Of course it was Hemingway. I had seen photos of him but didn’t put two and two together until that moment and of course, had never met him before. I did as he suggested and went to meet the lawyers. After explaining the situation, which didn’t seem at all unusual to them, I paid them their asking fee of $50 for their services. They returned with me to the boat and chatted a while with the customs officials. After a few minutes, one of the officials signed the papers and cleared us for entry into Cuba — free of charge. That was well worth the $50 investment. Hemingway, who had been watching everything, called down for us to come up and join him for a drink. We introduced ourselves, and he asked us where we were from. I told him that we were from the Keys to which he replied that we were lucky men, and there was no better place to live. He said that he had plans to get to the Keys again soon. (He eventually bought a home in Key West, which is still open for visitors to tour today.) He ordered us some strong rum and Cokes, which became known as the ‘Cuba Libre.’ We talked, and drank some more, and talked some more. Hemingway said he was doing a lot less writing these days and also less fishing, but he still managed to take his boat, the Pilar, out at least once a month. He also told us about fighting a real mean marlin once and lots of other fish tales. We were thrilled to be talking fishing with this famous man. I recall the day with this literary giant clearly, even 50+ years later. He was dressed in long shorts and a sloppy comfortable shirt, and smoking a big cigar. We spent more than two hours together drinking and talking. Once he left, we went to a nearby hotel to get some shut-eye, as we had to leave for the Isle of Pines early the next morning. We made it up at the crack of dawn, no worse the wear for all the rum and Cokes we had the night before. Our first stop was at Puerto Esperanza for fuel and then on to the small city of Los Arroyas located on the western tip of Cuba. A gunboat followed us, and once we docked, they checked us up and down. Castro and his guerillas were already in Cuba of course, but not in power yet, and this was the usual routine for unknown boats. The gunboat had not received any word that we were coming, or that it was okay to let us pass. They must have finally decided we were okay because eventually they left us in peace. The sun was almost down, and we decided to sleep on the boats that night. However, a barge pulled up alongside us loaded with pigs and the horrible smell and noise kept us from getting any decent sleep. Never disturb a sleeping pig, you’ll get told off in no uncertain terms with loud squeals. We set off extra early the next morning to get away from the pig odors as quickly as we could. As we rounded Cabo Corrientes on the southwest tip of Cuba, we ran into a terrible storm. It was blowing like mad and the waves were pounding over the sides of the boat. We watched helplessly as we saw the skiff with all of the supplies sink into the rough seas and by then, even our own boat had started leaking. On top of everything else, the boat’s bilge pump wasn’t working, so Chuck and Hazen were bailing with buckets as fast as they could while I steered. This continued for several hours when, after what seemed like forever, the storm let up, and we were in calmer waters, which thankfully lasted for the rest of the trip. At one point, we ran aground at San Felipe Keys, but managed to pry ourselves off and continued on to our final destination, Santa Fe, on the Isle of Pines. Vic was relieved to see us pulling into the dock at last, as we were long overdue thanks to that storm. Although he was visibly disappointed about losing his supplies and boat, he knew there was nothing that we could’ve done. We stayed at the lodge for a couple of days taking it easy, and Vic introduced us to a man named Carhega who had a 40-foot Chris Craft that he wanted ferried to Cuba. As we had to go that way anyway, we agreed on a fee and headed back to the International Yacht Club in Havana harbor with his boat, with clear weather all the way. We looked to the upper deck at the Club after we docked but didn’t see our newfound friend there this time. We stayed overnight at the same hotel as before and headed to the airport the next morning to catch a flight home. Upon producing our passports at Immigration, they insisted that we needed the Dutch Embassy to stamp them first. I thought this was really strange but they explained that the Dutch needed to release us, as the boat we had brought in was registered under their flag. So, off we went to the Dutch Embassy, who said they didn’t do that kind of thing and had no further suggestions. I was beginning to wonder if we’d ever get out of Cuba. With no other ideas, we headed back to the International Yacht Club to eat something, and as luck would have it, Hemingway was in his usual spot once more. He said he was happy to run into us again, and asked how the trip over to the Isle of Pines went. We told him all about the storm and the loss of the boat, and then went into the story of our latest bureaucratic problems. He told us to stay put and went to make a phone call. He came back with a slip of paper that he handed to me. He said this was the name of a customs official at the airport that we were to find, and he would sort things out for us. We finished eating, thanked Ernest again and headed back to the airport one more time. He had come to our aid yet again. We found the customs official easily at the airport, and he sailed us through with no problems. We boarded ‘Q’ Airlines to Key West for the enormous fare at that time of $10 per person. I often wonder how our trip would’ve turned out if we hadn’t met Ernest Hemingway. 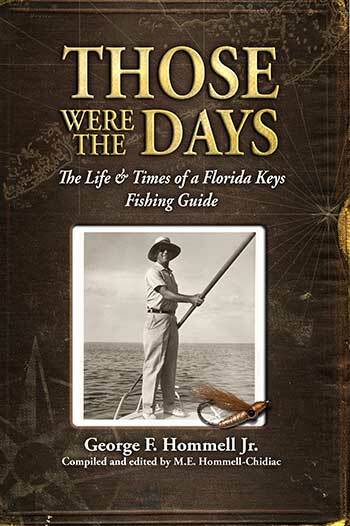 “Meeting Hemingway” was excerpted from Those Were the Days: The Life & Times of a Florida Keys Fishing Guide by George F. Hommel Jr., with permission of the publisher.